Free Forex education. No thanks I’d rather pay. At least I can say I’ve been done, when it doesn’t work. allenbary: It seems funny, but I do kind of wonder sometime, I probably out trade most people, I trade month over month with over 92% accuracy. Yet with the hundreds of hits I get on my website, videos and forums. Very few ever take the time to pay attention. There was about 4 people watching the chat session, although there is normally 1 or 2 more. On the forum there are 57 members who have joined up and only 17 have visited in January making 40 absentee’s this month. I don’t usually comment on the chat, as I’d rather listen and learn. If I’m in work on the day, then I go back with the charts printed off, making any relevant notes on from the chat. The forum I visit every day and contribute when I feel it is relevant. It’s an unbelieveable free service Allen is giving, that few appear to want to get involved in. Maybe they would rather pay someone because they feel that there’s no such thing as a free lunch. Who know’s, maybe I was once like them. 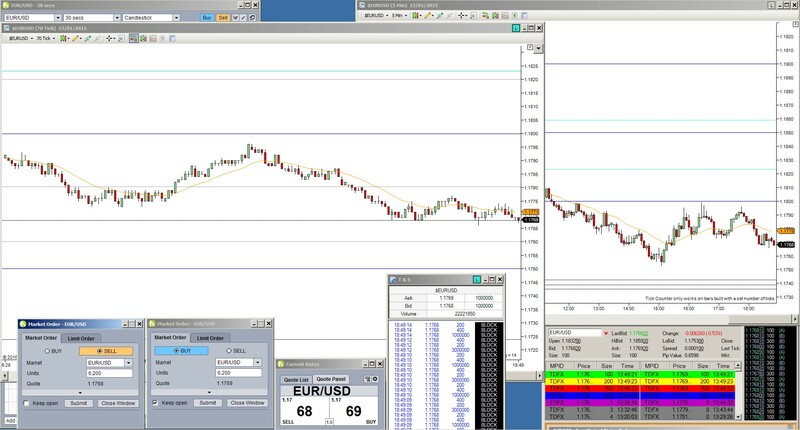 Anyway I’m trading off the 70 tick charts with the 20 ema on the free ninjatrader platform that I have obtained via traderAllen’s forum. I also have the 5 min chart up on ninja to confirm the trend direction with the 25 ema, partly because I’m presently half way through Bob Volman’s new book. I’m using trading view for my longer term time frame analysis. I was paying £9/month for the multichart function but have now obtained that for free. 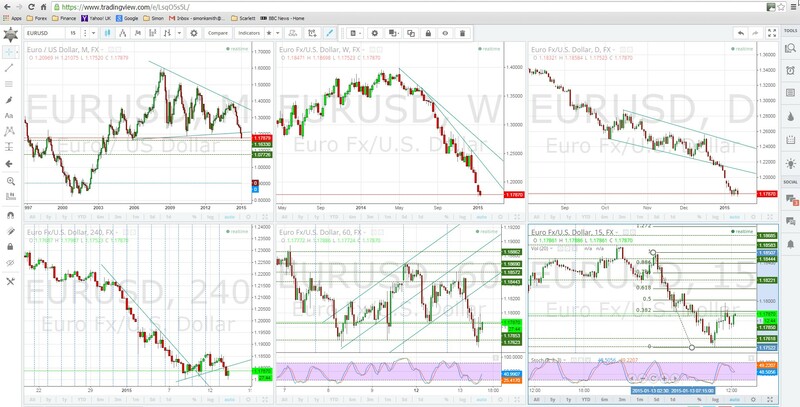 I use tradingview because of the ease of using its drawing functions and the length of backdata that I have. The monthly charts go back to 1972! I like the idea of getting the longer term charts trend directions lined up. traderAllen does this to determine risk per trade and so do several other notable educators. Shonn Campbell in his new book, ” Inventory Trading,” uses multi timeframe trend analysis as part of his routine. I thought I would mention Shonn, as in his book he mentions scalping his way out of losing trades and I’m hoping for us scalpers, he would go into more detail about this. Anyway after playing around with the sim on ninja for a month, today I put on my first live trade with my old broker Oanda. 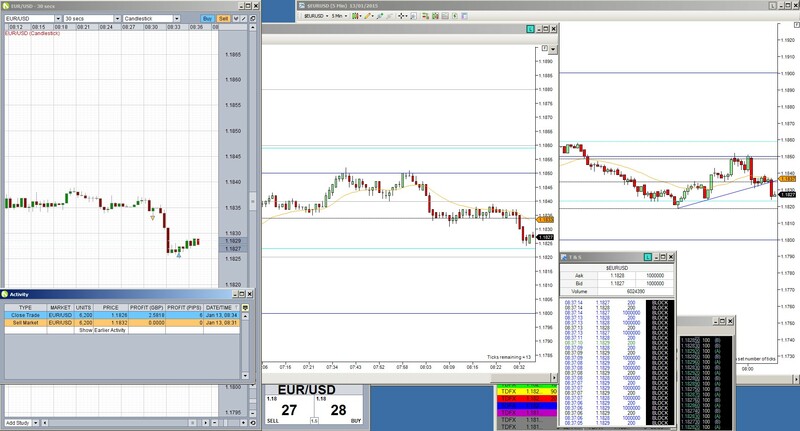 I think I will eventually join up with MBTrading aswell as I’ve obtained the ninja software via the demo account. Also up on my screen is the ninja time and sales and the MBT level II which plays a big part in traderAlenn’s scalping and which I’m yet really to use effectively. Here’s my tradingview set up. The stocc oscillator is only to point out divergence and give more confidence in a change of direction. Fibs are taken from the days swings to determine where the fib bots are coming in. Trend lines are put on the charts rather than ma’s, and notable points of support and resistance also. Here’s my trading screen set up. The Oanda 30 sec chart is only there to monitor my in trade position, hidden behind the 70 tick chart as was this scalp in the London session. From now on I’ll be journalling my progress. Don’t expect too much at once. Allen says get the month done for break even to start with. It’ more important to preserve capital than to take too many risks. good luck simon. looking forward to more posts with your winning trades!